I intend to release a preview version around the end of the year 2013. After this preview version, I will focus on polishing the app for the first public release. This means I will implement whatever feature will be missing from the preview version, and also will listen carefully to your feedback and try to fix and improve as much as possible. Hopefully, that will make a good first public release fully compatible with what we in the Foundation call Wherigo v1.0 (a.k.a. the good old Wherigo we all are used to play). One of the main areas of the app is the “game home”, that is the main screen you see when you play a cartridge. I designed a pivot page to hold the classical tabs of the game, but not without slightly tweaking one of them: the world tab here holds both the zones and the famous “you see” list. No pictures of the overview tab, since I haven’t worked on it yet. The background of these screens is the image defined as the cartridge’s main image. I like the look and feel of it, but it really depends on what kind of image the cartridge author has set. Here on the Wherigo Tutorial cartridge, the image does not work at all. The app will of course allow you to disable this background, but I want in the future to intelligently scale and blur the image to make a nice background improving the playing experience. The details screen is not very advanced. You can see that commands are displayed, but not in a very pretty way yet! When it comes to Messages, I use the built-in Message Box system to display them. It’s very convenient, even though they don’t interact very well with Inputs yet. Well, that’s all for today. I’ll be watching the thread so feel free to comment. thanks for your efforts, I like the idea to have Wherigo on the Windows Phones in near future. The 1st pictures looks very promising. As I've just moved from my old Oregon 400t to a new Oregon 650 (and Garmin in their infinite wisdom have abandoned Wherigo support on their GPSrs) I'm delighted to hear of your plans to launch an app for Windows Phone 8. As I also have a Lumia 620 Windows Phone this will allow me to pass on my Oregon 400t to other family members rather than keeping it just for Wherigo caches! Here is a quick update message. In the last months I have been busy working on the app and especially on the core engine behind it. This is the reason why there isn't much to show. In fact, most of my efforts were about dramatically improving the performances and reliability of the app. But I still have a couple of new things. First, the "overview" tab of the game screen is finally populated! I have ideas to improve the readability of the screen, but until the first preview release, it will have to do. There are two new screens. The first one shows information about the cartridge and allows to start a new game, or load a previous savegame. It is the last "big" screen that needs to be done before the preview release. The second one is the app's starting page. It's a nice Panorama view with Hub tiles for cartridges. It will also display the recently played games, and later (way later!) the nearby games, etc. The ETA is not changing: the preview release is still planned for the end of December. As a final note, I want to say thanks for all the encouragement I've received from here or elsewhere. Yes Please! Looking forward to December, I'd love to do Wherigos on my phone. I'm a software developer at Microsoft. If you'd like any help, I'd love to offer it. I started looking at porting Lua to WP when i ran across this thread. Thanks for your message. I actually have been working for a year now on efficiently porting Lua to WP. We've switched libs and bindings several times and are now super close to something that works well on all platforms. For WP we're using KopiLua (a line-by-line C# port of the C lua lib) which I modified to run on WP7. On other platforms we use the native lua lib when possible. Over all that we have a set of bindings that provide with cross-platform thread-safety and Lua memory management. Just a quick update to say that I unfortunately probably won't have time to produce the preview release before the end of the month. A lot of time was spent in the last weeks trying to improve the performance and memory consumption of the core engine charlenni and me are writing, but not all the bugs are gone. Most of the Windows Phone app is ready now, at least ready for preview. I just need to fix saving and loading and a couple of other stuff. So the new target date for the first preview release is Wednesday, January 15th 2014. I hope everyone will get a good Christmas time, and a happy new year. I just can’t wait .. I will be so good try this APP ..
After much work, here is finally the first-ever Windows Phone 7-8 Wherigo Player. You can play on Windows Phone now. Keep in mind, this is still a preview version, which means that there are still bugs and problems and missing features. But there is enough to allow to play all cartridges to completion, including savegames, sound playback, image display, etc. In fact, it will. So please use it and make it crash, and report problems here when you found some. Also, if you are missing a feature, or find something complicated to use, please report it. This will help making it better. Starting now, and depending on your feedback, the app will undergo minor modifications, namely bugfixes and UI changes in order to make it better to use, and more reliable for playing what we call Wherigo 1.0. In parallel I will make it compatible with Wherigo 1.1, which includes fancy things like direct downloading of cartridges, automatic synchronization, mapping of zones during play, etc. Then sometime the app may be ready to be released on the market place. Install the Windows Phone SDK. Start the Geowigo app on your phone! I know this sounds like a lot of work to install the app, but for now there's no way around. For now, you have to upload the cartridges to your phone using a special tool. Download a cartridge from the Wherigo website. Download the tool IsoStoreSpy WP7+ Beta 5. In the drop-down list select "Windows Phone Device". Double-click in the list on the item. "Unknown name / a4d3826a-6eb5-47d1-b1b2-3075bbd5cd64"
Click on the arrow next to "IsoStore" in the folder area, then click on the folder "Cartridges". Here you can upload your Wherigo cartridges by clicking on the Upload file button. I cant handle this. I tried to install SDK on my pc, but it is not compatible with XP, so i tried on my fathers Win7, but it is compatible only with SDK 7, which is not compatible with my WP8.. Please, try to put it to store as soon as possible, because I really want to try it. Thanks a lot. Those of you who have developer-unlocked devices can follow the instructions I left. Those who don't, please send me in Private Messages the email adresses that are associated to your Windows Phones. I will add you to the Beta program on the Windows Phone Store, so that you can download and use the app. I have loaded the XAP on a Nokia 1020 WP8 and a Nokia 900 WP7.8 successfully. I've also uploaded a couple of cartridges to each phone and run one briefly on each phone. I will get out and do some more testing this weekend. 1. You need to create the Catridges directory on your PC and load your cartridges there. Once you connect to the phone using IsoStoreSpy, you upload the complete directory. 2. For WP7.8 phones use IsoStroSpy WP7 Beta 5 (Win7+) (http://isostorespy.codeplex.com/releases/view/106874). 3. For WP8 phones use IsoStroSpy WP8 2.1.1 (Win8 only) (http://isostorespy.codeplex.com/releases/view/106789). Also, I'm planning on using a couple of play anywhere WIGs for testing... Any concerns about this? I downloaded the Pocket PC Device Cartridges for these WIGs. Is this the correct format or should I be using another device type? Looks good so far. Thanks for the good work. Just tried run "Four Min Hourglass" WIG on WP8. 1. Phone kept trying to go to sleep... Can you disable sleep timer while running a WIG? 2. Title of Object in Inventory ran off screen and was incomplete. 3. Description of Object in Inventory ran off screen and was incomplete. 4. Description of Task ran off screen and was incomplete. 5. Can you default saved game title to included WIG title and date/timestamp? (just noticed that the "recent" window has all the information I need so this can disregarded). First and foremost, for those of you who sent me your e-mail address for the beta on the store: thanks a lot. It's taking more time than it should. We're still setting up the account, so please be patient while we're trying to sort it out. You should definitely be able to play some day next week. Nope. Play anywhere cartridges are supported. 2: Truncating long titles is a Windows Phone UX guideline. 3&4: Did it run off-screen on the right or on the bottom? 5: I actually intend the default title to soon be descriptive of location, somehow. Like "Inside Castle" or "Near Frog". The app has gone through the Beta submission process and is on the store. But it is not public, and will only be able to be downloaded by those people that have sent their Windows Phone e-mail addresses to me. The only problem for those of you who are in this case, is that you will not be able to install cartridges on your phone without the SDK. So, I will proceed and implement synchronization with SkyDrive. That way, you will be able to download cartridges from Wherigo.com, upload them to your SkyDrive account, and then the app will retrieve them on its own. Again, if you managed to install the SDK, feel free to follow the instructions in this post to install cartridges manually. If you didn't install the SDK, or don't want too, please hang in there as I implement this important feature that will finally allow all to test the app. I am deploying a new update to the app, that primarily introduces synchronization with SkyDrive. All owners of Windows Phones have a Live account and some cloud storage on SkyDrive. With this latest update, you can link the app to your SkyDrive account, allowing it to automatically download any Wherigo cartridge (.GWC files) that is in the "Geowigo" folder. This allows owners of locked phones to not need to install cartridges manually. Create a "Geowigo" folder in the root of your Skydrive. Go to your phone and launch the app Geowigo (version 1.0.1). If no cartridge is installed, the app offers to link to Skydrive. Tap on "SkyDrive: Tap to link". Once you allowed the app to link, you are being brought back to the main page of the App. (Because of a bug I haven't been able to identify yet, you need to restart the app for the downloading to work. If you don't, you will see "SkyDrive: Linked (Syncing...)" but nothing will ever be downloaded.) So, restart the app. If you can read "SkyDrive: Linked (Syncing...)", files are being downloaded. If you can read "SkyDrive: Linked", it means that no file has been found. Make sure that you have put at least one GWC file in the "Geowigo" folder at the root of your SkyDrive. For developer-unlocked phones: simply grab the XAP file and deploy it. For the rest: those who have already sent me an e-mail, I am coming back to you. For the others, in order to download the app on the store, you need to be invited. Therefore please send me your Windows Phone e-mail address so that I can invite you. Thank you for this great Player. Thank you for you work, can´t wait to play with it! I loaded 3 cartridges to my skydrive so far, from the list I chose version for the "pocket pc device" as the 3 others were for garmin. Right? Then created Geowigo folder to the root and made sure those cartridges are there. But then I couldn´t get them loaded to my phone. App says linked to skydrive and syncing goes for max 10 seconds, after that syncing disappears and it´s only linked. Doesn´t help to restart the app, same goes after 10 tries. My phone is lumia 620, any ideas? It seems you have been doing it right. What extension do the files have on SkyDrive (precisely, taking into account lowercase and uppercase letters)? Can you make sure that the files have a lowercase extension (exactly ".gwc") and try again and tell what happens? Scandinavian letters should be no problem. Do you mean in filenames, or? I managed to reproduce a similar problem: if the file extensions are not exactly ".gwc", the cartridge won't download. I'll fix that and it will be in the next update. Those files were .gwc and with scandinavian text support I mean that text inside the games. Second time was a success! This Wherigo shows 16 houses, so it's a good test. Notes: now I could save anytime but it crashes instantly when trying to load them. And when text is longer than fits the screen, there is no "next page"box to press. Only solution to get forward is press back and then cancel. when walking to next place, there is a small purple arrow showing the direction. Only way to figure out which way to go is take some steps and see if the number is decreasing or not. This was a really great end result, found a cache too! with scandinavian text support I mean that text inside the games. I need to test this more thouroughly indeed. Did the special alphabet characters appear as their latin equivalent (like ä -> a) or did they appear as garbage characters (like ? or �)? First test done: it started allright, I found 5 first places. Could only save once, after first found place. When reached place number 5 it would have asked me some question but all info just disappeared. Can you explain more in details what happened? Why couldn't you save more? What happened after the info disappeared? now I could save anytime but it crashes instantly when trying to load them. And when text is longer than fits the screen, there is no "next page"box to press. Only solution to get forward is press back and then cancel. What text do you mean? And on which screen? 2. Game started allright, down at the screen where the three dots are (saving possibility) disappeared after first found place and didn´t show anymore. After that fifth place found, there was a box showing "questions" but I wasn´t able to press that box. Then it went in such state that I couldn´t proceed even with back+cancel. If I remember right the screen went black. 3. Cartridge is for GC33PYA. I saved 9 times during the second game and they show in the list. But when trying to load, it says "restoring the cartridge" for 2 seconds, then quits the program and goes back to program list of my phone. 4. Text which introduces houses during this game doesn´t always fit my phone screen. It shows OK, it´s just so long. It seems that even if I can scroll down the whole text, the "next page" box doesn´t come along. It sometimes showed the upper line of that box but I couldn´t press it. And to proceed had to press phone´s back-button and then choose cancel when it asks do you want to quit the program. Then it jumped to next page or showed distance to next place. Would you like to have future test reports straight to your email instead of this forum? I don´t know if people want to read my long stories. You can always cherry-pick to publish here if there are some important stuff. I want to ask, if the text should look like on the attached image. If yes, could you explain, how you made this special characters? By hand or with a builder? That's the description of the cartridge, no in game screen. That's normal and could not be done better with the Groundspeak website. The characters are coming in this way from Groundspeak. It would be much more interessting, if the first screen, which you see above in my last post, looks the same way and has special characters. Notes: Saved game can´t be restored here neither. Yes, that's a encoding problem of the player, not the engine. How did you made this cartridges or aren't you the owner? Thanks for all the work for this Wherigo application! I have been looking forward to it. I have a Nokia 920 and unfortunately I couldn´t even get that Windows Phone SDK for my phone. 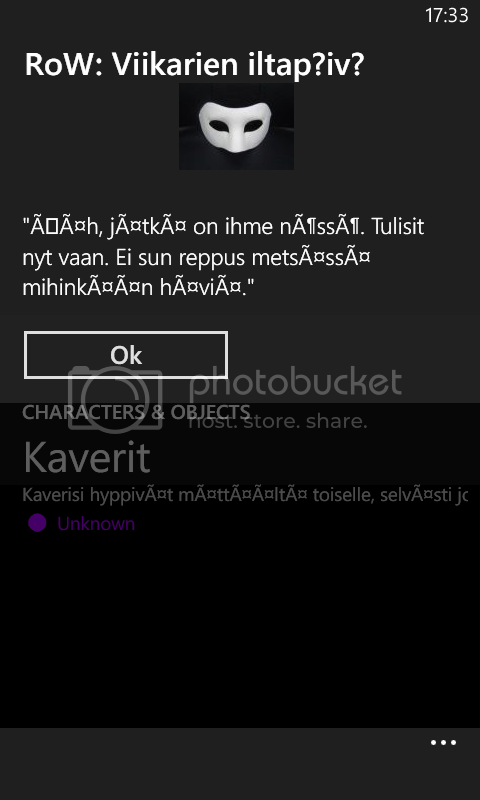 The text in my phone said: "This file cannot be downloaded, because WindowsPhone doesn't support this kind of file." I's such a shame that nobody sells gps devices with Wherigo anymore. I fear, you misunderstood it. If I am right, the Windows Phone SDK is for your PC, Not for your smartphone. Hi, could someone send me a link to the application, where can I download it from Windows Store? Many thanks. Send me an email or private message and I'll send you a link to download the app from the store. Thanks for wanting to participate in this beta. Even if you had the link, you couldn't download the app because it's on invite only. I am currently receiving several demands for invite every day. The process to invite somebody requires me to push an update to the store, update that takes up to 2 hours to complete. Because of this, I am inviting people in batches, once or twice a week. If you have sent me an e-mail, you should get a reply within a week. I am currently deploying a new update that focuses on stability and usability. Most of the crashes that have been reported so far are fixed. The app is much more stable now. Also, several usability issues have been solved. All non-English speaking players will be glad to know that non-latin characters are now correctly displayed in-game. Long message boxes are now fully scrollable, and the application bar hides itself more cleverly. The complete list of changes is available here (between Jan 28, 2014 and Feb 06, 2014). Updated my Geowigo and tried those saved games from 2 weeks ago. Now they are loaded with no problems. The compass works with saved games, seems to give right direction when I turn my phone around. Have to find some time at weekend to test more, now it looks great. Also those scandi garbage are gone from screens inside the game. Thanks again for the good work!! I have noticed different problems with the newest version that I will fix in the next one. Are the arrows always in the right direction? Are the arrows big enough to read? Do you notice any problem? I tested updated version at Saturday with gc2mypk. Otherwise it worked OK but the compass lives the life of its own. It calibrated and then worked maybe 3 minutes, after that it seems to loose direction. Could there be a manual calibration option? Distance is always right to the next target. I can read it but it wouldn't hurt if it was a bit bigger at the screen. I note this. Can other testers try this and report how the compass behaves? Country Victoria (Australia) and nothing nearby, so testing some locationless ones. Weather today - combination of I think light cloud cover, but quite smoky from bushfires about 50km away. Always in direct line of sight with local phone tower and minimal tree cover if any. Tried Anywhere easter egg hunt around home. Very hit and miss. get first egg, then the distances to nearby eggs didn't change as we walked around. The map on the navigate screen at the start was pretty spot on. Next tried Wherigo player tutorial. initially couldn't get anything with it, then rebooted phone and worked fine, although couldn't find any progressive distances. Just notified me when I arrived. My son enjoyed it. Upon completion, tried egg hunt again and still no good. tried rebooting phone again, and still not much luck. Reboot app again, and managed to keep my son a bit happier this time although again distances to eggs didn't change much, but at least he got more eggs. the arrows jiggled around a bit as we walked. later went to local football field. Tried Kelowna's Challenge Bear. positioned ourselves in appropriate spot and pressed play. first time it indicated we had to go over 21000km nth east. restart app, and now we had to go over 15000km southerly direction. reboot phone, and the 15000km came up again. as we walked around the arrow did again jiggle around in a seemingly consistent direction. maybe cart can't cope with southern hemisphere. Gave up, and gave the egg hunt another bash on the field. similar outcome to home, although the distances seemed to reset after we walked about 50m. What I mean is that there were about 5 eggs in one general direction between 20 & 30m away. Followed the arrows, and about 40m away from starting position without any finds it then told us the eggs were about 30 m away in a direction perpendicular to the one we were travelling in. Going to outskirts of Melbourne tomorrow, so might have a chance to test with better phone coverage. I've just deployed the app on my phone (Nokia Lumia 710) and almost straight away I have run into a problem. When I try to connect the app to skydrive, I manage to log in and allow the app to access my data but afterwards when it is trying to connect I get an error message saying 'Plop'. After this happens, when I start the app I get the splash screen but the app freezes and closes almost straight away. I have tried re-starting my phone and re-installing the app but this won't fix it. It seems to do the same in the 512 mb emulator. I like Mangatome's sense of humour with the error message, but it would be nice if all the error messages had a bit of humour (like plop) but also had an error number. I find this very useful when programming with PHP because it allows me to quickly find where the code has gone wrong. Thanks for the feedback. It would be great if you could test with even more "play anywhere" cartridges to see if these kind of problems are recurring. Yes, the "plop" message box was a debug prop I forgot to remove before deploying 1.0.2. I removed it since then. No need for an error code, I know perfectly what problem "plop" corresponds to. There seems to be a bug in MS's SkyDrive API that makes a download request timeout without response right after the user signed in. Restarting the app makes the SkyDrive API log in again, and then downloads start working. I noticed that several exceptions have been reported on the app's BugSense yesterday. They seem to be linked to your problem and I will investigate. I am extremely happy to finally see a Wherigo app on Windows Phone! Keep up the good work! Finally, I have an issue to add. See the screenshots. See those small green texts on the dark backround? It is very hard to see the small arrow and the small distance measure on a pitch black forest. And you cannot turn a flashlight on the display because it just reflects the light and you cannot see anything (I know, I tried that). Could you make those bigger and/or add a full screen compass, please? As the first priority, I would like to see that the app would nicely resume the current game after the screen is unlocked. Here in Finland the temperature outside is now below zero and it is not nice to run outside without gloves while holding a mobile phone on a hand (I know, we are crazy and we like to go geocaching in a freezing weather too ). I mean, between the waypoints, I want to lock my phone, put it on my pocket and pull the gloves back on. The other issues are not a big deal for me (except the crash). The app looks good and as a developer I see that you have done great work. The app needs only a bit of fine tuning, but I like it already Big thanx to you! As the first priority, I would like to see that the app would nicely resume the current game after the screen is unlocked. I hear you. It's even been in my backlog for a month now. But it's a trickier problem than it may seem. Saving the game is a long operation. As a matter of fact, it can take up to 20 seconds on my Omnia 7. Although it makes the most sense to perform an auto-save when the app gets deactivated (i.e. the user pushes the start menu button or puts the phone to sleep), the OS gives the app 10 seconds to perform state save operations. If it's still busy after 10 seconds, it will be terminated. I currently don't have any easy way to do this. My thoughts are in a background service that would be allowed to run past app deactivation, making a savegame and pausing (or not) the game. But this will take time to implement, and because of that, this feature will not be included in the next released. Then yet another problem hit me. I realized that the direction arrow was pointing to a wrong direction (apparently +90 degrees) and that I had walked towards east, but I should have walked towards north. I closed the app and opened it again. And it got worse. I hoped that the compass calibration would re-run, but it did not. Instead, the app had no clue of the position. I retried several times, but the problem did not go away. Only after waiting a few minutes without doing anything, the app finally got the position again and I was able to continue the game. I'm aware of the compass problem, I'm working on it. The position problem is new, though, and similar to something I've just experienced yesterday. I've fixed some things related to that, so we'll see if it gets better in the next release. I got an exception report yesterday from Finland, I guess it was the crash you described. The cartridge you played appears to perform an operation that is not specified in Wherigo (it tries to call event ShowScreen with a Media object). Because this operation is not specified, we didn't protected the Core for this case. In the next release, this operation will be ignored and the crash gone. Sure! I added a bigger direction indication in the details page of objects. Later I may add a full-screen compass page similar to the one in Groundspeak's app. I have deployed a new update that focuses on playability. The most noticeable change in this update is a bigger compass indication in a Thing's page. But you'll also find a manual calibration page. The usual crash fixes are also included in this update. The complete list of changes is available here (between Feb 08, 2014 and Feb 22, 2014). Thanks for the 1.0.3 update. I quickly played around with the UI and it seems that the compass offset of +90 degrees is a "feature" on Nokia phones (tested with Lumia 1020 and 1520). Do you mind if I post an issue report on Github?